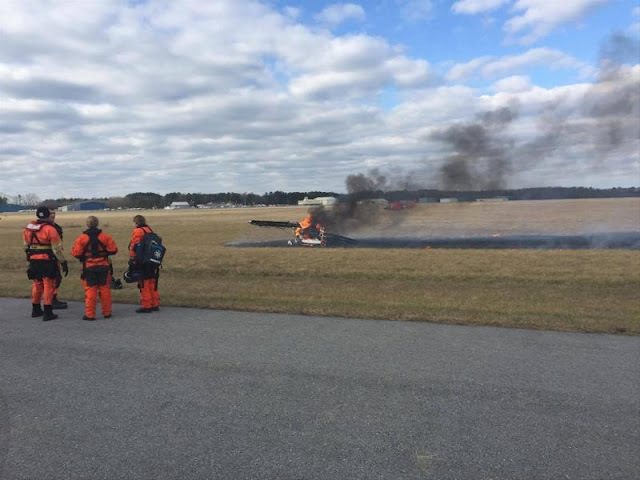 On January 28, 2017, about 1400 eastern standard time, a Piper PA-22-150, N3659Z, was destroyed after it experienced an in-flight fire following takeoff from Delaware Coastal Airport (GED), Georgetown, Delaware. The private pilot sustained minor injuries. Visual meteorological conditions prevailed, and no flight plan was filed for the personal flight that was operated under the provisions of Title 14 Code of Federal Regulations Part 91. According to the pilot, prior to departing GED, he checked the engine oil level, performed a visual inspection of the engine compartment and an engine run-up with no anomalies noted. 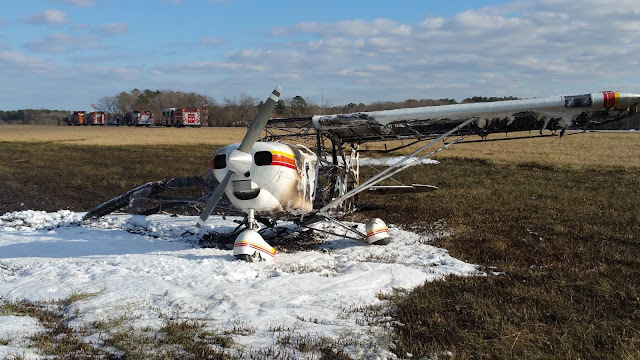 After departing runway 28, the airplane reached 1,400 feet, and the pilot noticed "thick" smoke coming from behind the instrument panel and then the glareshield. The pilot attempted to return to GED and opened the vent on the left door to evacuate smoke and allow him to search for a runway to land. He then noted flames by his feet and legs, and while "sideslipping" the airplane, burning portions of the roof lining began to fall on him. The airplane continued to descend, and during the subsequent landing roll, the pilot reduced the throttle and mixture to shut down the engine. He pulled on the brake handle; however, the airplane did not slow. The pilot proceeded to egress while the airplane was in motion. The airplane came to rest in a grass area off the right side of runway 4. 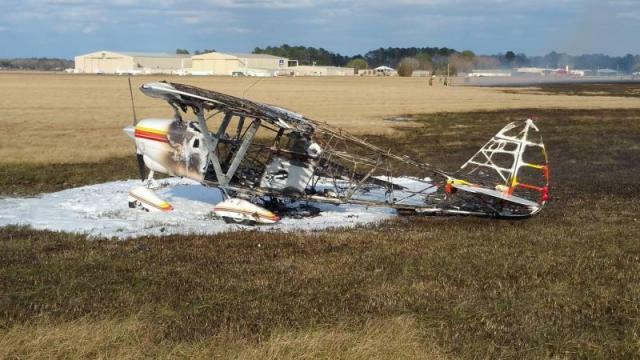 Initial examination of the airplane revealed that the fuselage, empennage, and right wing were consumed by fire. The left wing was partially consumed by fire. The engine remained attached to the fuselage and the propeller remained attached to the engine. According to Federal Aviation Administration records, the airplane was manufactured in 1960 and registered to the pilot on June 13, 1990. It was equipped with a Lycoming O-320-A2B, a 150-horepower engine. According to the maintenance logbooks, the airplane's most recent annual inspection was performed on January 1, 2017, at a total time of 3,740.5 hours, about 2 operational hours prior to the accident. According to the Piper PA-22 Owner's Manual, the airplane was equipped with two 18-gallon fuel tanks located in the wings, which drained individually according to the position of the fuel selector valve on the left forward cabin wall. "The main fuel strainer, through which all fuel going to the carburetor flows, is located on the lower left engine side of the firewall…The engine primer pump on the right side of the instrument panel takes fuel from the main gascolator and pumps it directly to all four cylinders of the engine." According to an NTSB fire protection engineer who examined the wreckage, the pilot's description of the fire in the accident sequence was consistent with a liquid fuel-fed fire. Several sections of the airplane fuel system were consumed by fire. The fuel selector valve was thermally damaged and its function could not be verified. The output fuel line from the fuel selector to the firewall was consumed by fire. The input fuel line from the right-side wing tank was also consumed by fire. The engine primer pump was not located with the wreckage. The primer pump fuel lines were consumed by fire inside the cockpit. Several small sections of copper primer pump fuel lines were located on the firewall with melted ends. The fuel primer lines in the engine compartment remained intact and did not appear to leak. The main fuel line from the fuel strainer to the carburetor, which was located on the left side of the engine compartment, was found loose on the carburetor side. The lower left portion of the engine cowling exhibited more thermal damage than the right side. 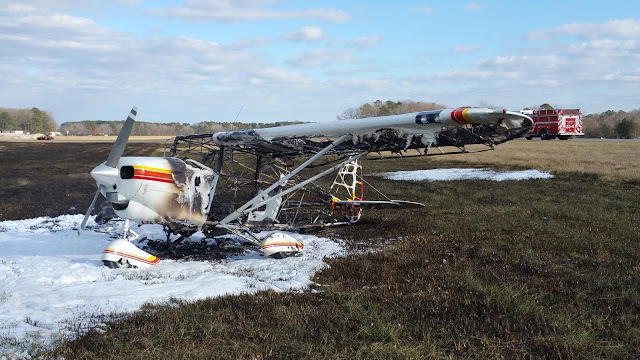 On January 28, 2017, about 1400 eastern daylight time, a Piper PA-22-150, N3659Z, was destroyed after it experienced an inflight fire after takeoff from Delaware Coastal Airport (GED), Georgetown, Delaware. The private pilot incurred minor injuries. Visual meteorological conditions prevailed, and no flight plan had been filed for the personal flight that was operated under the provisions of 14 Code of Federal Regulations Part 91. The flight was originating at the time of the accident. According to the pilot, prior to departing the airport, he checked the engine oil level, performed a visual inspection of the engine compartment, and an engine run-up with no anomalies noted. After departing runway 28, the airplane reached 1,400 feet, and the pilot noticed "thick" smoke coming from behind the instrument panel and then the glareshield. The pilot opened the vent on the left door to evacuate smoke and allow him to search for a runway to land the airplane. He then noted flames by his feet and legs, and while "sideslipping" the airplane to a runway at the departure airport, the roof lining began to fall on him. The airplane continued to descend, and during the subsequent landing roll, the pilot reduced the throttle and mixture to shut down the engine. He pulled on the brake handle; however, the airplane did not slow. The pilot proceeded to egress while the airplane was in motion, and incurred minor injuries. The airplane came to rest in a grass area to the right side of runway 4. An examination of the airplane revealed that the fuselage, empennage, and right wing were consumed by fire. The left wing was partially consumed by fire. The engine remained attached to the fuselage and the propeller remained attached to the engine. 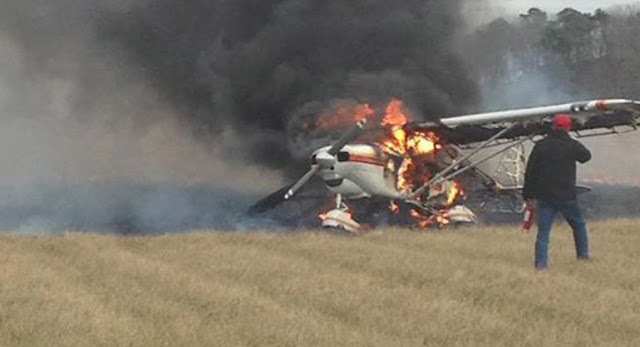 It is impressive that this pilot could slip to land and ground roll to a stop in a grass field, with a cockpit on fire and smoke obscuring his vision. Unlike most accident pictures, the plane here looks completely normal and intact, if you ignore the fact that it is completely incinerated. Good job getting it down! This pilot had nerves of steel and flew the plane all the way to touchdown. That's the only thing that allowed him to survive. I can't imagine the terror in that plane at that moment thinking that you're going to die in the worst possible way. The will to live is strong in this man. Hope he made a full recovery but if it were me I don't think I could go up in a small plane ever again! I would like to know which covering system was used on the fuselage. That plane burned like a balsa & tissue model airplane. The more I look at the picture I'm guessing that the fire in the field is what caused the fuselage covering to burn. It looks like the covering melted on the side of the vertical and the rudder but is still intact on the upper surface of the horizontal. Melted poly-fiber? The intense heat from the burning plane is what caused the dry grass in the field to catch fire. It's like what came 1st, the chicken or the egg!